Trumpeter Master Gunnery Sergeant Kurt Dupuis joined “The President’s Own” United States Marine Band in September 1992. He was named principal trumpet in 1997. Master Gunnery Sgt. Dupuis began his musical instruction at age 8 and studied with Terry Detwiler, former Marine Band solo cornet. He graduated in 1985 from Spaulding High School in Rochester, N.H. and earned a bachelor’s degree in music from Boston University in 1990 where he also pursued graduate studies. Master Gunnery Sgt. Dupuis’ teachers included Roger Voisin, Peter Chapman, and Dr. Robert Stibler. In addition, he has received extensive coaching from Rolf Smedvig, Timothy Morrison, Jeff Curnow, and Susan Slaughter. Prior to joining “The President’s Own,” Master Gunnery Sgt. Dupuis was a fellow at the Tanglewood Music Center in Lenox, Mass., and was a participant at the Grand Teton Orchestral Seminar in Jackson Hole, Wyo., for two summers. He also was a member of the Atlantic Brass Quintet, winners of the Coleman International Chamber Music Competition, Summit Brass International Chamber Music Competition, and the Rafael Mendez International Chamber Music Competition. The quintet toured the U.S. and Canada under Columbia Artist Management and coached at the Empire Brass Seminar at the Tanglewood Institute. Master Gunnery Sgt. Dupuis has performed in conjunction with the Empire Brass both at Carnegie Hall in New York and at the Bermuda Arts Festival. 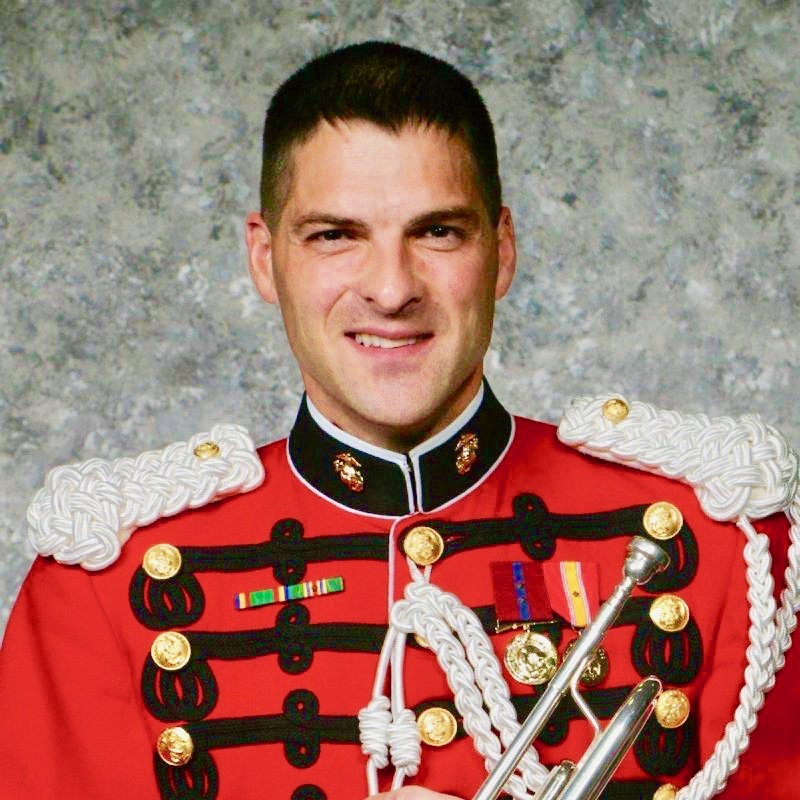 He has been featured as a soloist with both the Marine Band and Marine Chamber Orchestra, frequently conducts masterclasses at universities and has published an article in the International Trumpet Guild and The Brass Herald.